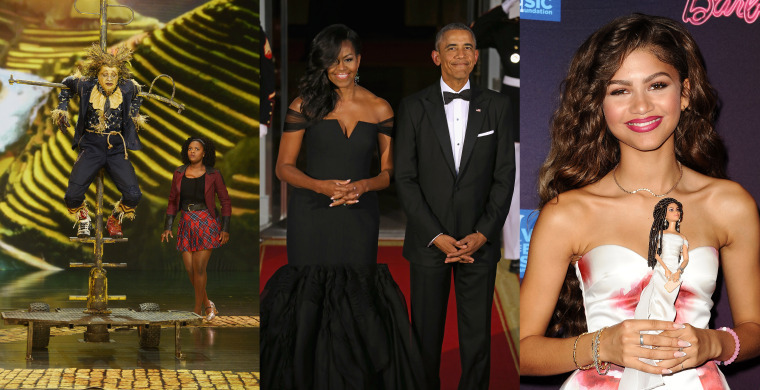 Were you wondering what moments this year exemplified the phrase, "Black Excellence"? Say no more. NBCBLK narrowed it down with the list below. They should have called the month of September, “Melanin.” Let’s be honest. So many women of color graced the cover of September magazine issues this year. It was refreshing, especially in an age where people of color have pressured the fashion industry to showcase all shades of women. Brava Melanin –- oops, we mean September! Here’s the list: Beyonce on Vogue, Ciara on Shape, Kerry Washington on Self, Queen Latifah on Variety, Willow Smith on i-D, Amandla Stenberg on Dazed and Serena Williams on New York magazine. Vogue magazine didn’t just notice that Black Girls Rock once, but twice. The No. 1 fashion magazine already stopped us in our tracks by having Beyoncé on their September issue, but Black women collectively shouted, “Yess!” when they upped the ante and chose Academy Award winner Lupita Nyong'o to face their October cover. Mattel presented Barbie dolls in the likeness of two prominent Black women in Hollywood this spring. But these weren’t your typical dolls with long and shiny hair. These miniature figures of actress Zendaya Coleman and director Ava DuVernay rocked dreadlocks, a common hairstyle among Black women and men. And even though Coleman’s doll never went on sale, DuVernay’s did this December and within hours the dolls were sold out on Barbie's website and on Amazon. Albeit, we have to wait until 2018. However, the studio already named Joe Robert Cole the screen writer, and Chadwick Boseman will play “T’Challa,” the man who suits up as Black Panther. “I am still pinching myself... I kinda can't believe I did this twice.” –Serena Williams, after winning the Serena Slam. Williams ended the year by sitting atop the sports throne on the cover of Sports Illustrated. The sports magazine named her the “Sportsperson of the Year,” making her the first Black woman to be given the title. The Wiz Live! was the personification of Black Excellence in the performing arts. The live musical was a splendid, whimsical live performance from start to finish. From the incredible choreography from Fatima Robinson to glass-shattering and gut-wrenching vocals from Amber Riley and Mary J. Blige, it was a magical moment that left people in tears, others applauding from their living rooms and many searching for gifs to accurately display their unrecognizable level of glee. What we unequivocally admired from larger-than-life production was how UNAPOLOGETICALLY BLACK it was. It oozed of Black creativity, Black sophistication, Black lexicon, Black dance and, of course, Black Excellence. Can you name another 3-year-old who had a better year than Riley Curry? We’ll wait. It all started May 19th when her father, star Basketball player Steph Curry, brought her to his postgame press conference after the Golden State Warriors won game one of the Western Conference Finals. Needless to say, she stole the show. She yawned, she interrupted him and she hid under the table. While many criticized Curry for bringing his then 2-year-old daughter to the press conference, saying she was a distraction, others considered her adorable. People thought she brought humor and freshness to a usually dull and redundant presser. Curry ignored the naysayers and brought her to another postgame presser. This time it was after the he and the Warriors won the Western Finals, advancing them to the NBA Finals. And yet again, all eyes were on Riley. Clips and memes of Riley at both press conferences flooded social media making her a viral sensation. Since then, any appearance of her on her mother, Ayesha Curry, or father’s Instagram receives hundreds of thousands of likes and usually becomes the number one topic of conversation the next day. But besides having those two huge moments in May, Riley became a big sister, attended the Kids' Choice Sports Awards and turned three in July. Thanks Riley for showing us there's nothing better than a young, carefree Black girl! What can we say about Steph Curry and Cam Newton that hasn’t already been said? Up until recently, these were the two franchise players who didn’t know what a loss felt like. Newton and the Carolina Panthers are still perfect at 14-0, with only two more games to play in the regular season and Steph Curry and the Golden State Warriors have the best record in the NBA at 26-1. These two Black men are single-handily dominating their respective sport and they are doing it with grace, fun and humility. After every Panthers touchdown, Newton gives the football to a kid sitting near the end zone. It’s become a weekly tradition that kids look forward to and one that’s earned him much respect among his teammates, analysts and fans. He also made history this past Sunday becoming the first football player to throw five touchdowns, pass for 300-plus yards and rush for 100 yards in the same game. So, what do two of the best players in American sports say to each other when they are texting or talking privately? They encourage and support each other. “[Newton] should be the MVP when it’s all said and done,” said Curry. And we agree. When President Obama and First Lady Michelle Obama stood in front of the White House on Sept. 25th, hearts stopped, mouths dropped and photos of the dynamic couple drowned social media. It had nothing to do with the reason why they were there, which was to host the Chinese State Dinner. It had everything to do with the Black love and Black empowerment that exuded from the multiple photos taken of them from this moment. The First Lady donned a Black off-the-shoulder, mermaid dress from Chinese-American designer Vera Wang. With her hair swooped to one side, she stood beside her husband, who acted as the luckiest man on the planet. Yes, photos are worth a thousand words, but these photos were worth a million and they all end with #RelationshipGoals and #BlackLove.